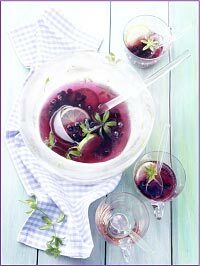 Mix white wines and woodruff syrup in a large, 4-quart punch bowl. Wash lime, pat dry and cut into thin slices. Mash slightly to release essence. Add frozen blueberries and lime slices into the bowl.